All white outfits are kind of hard to pull off but it shouldn’t be underestimated. This minimalistic look will give you a fresh and neat aura that will make you stand out in the crowd making a statement. Since it only needs white clothing pieces to achieve the fashionable look, the safest way obviously is to wear a pair of white jeans, a white t-shirt, white jacket and pair of white shoes. White-on-white outfits are perfect for summer and warm weather. Below is our guide on how to wear your all-white outfits the coolest way possible. Here are some tips on how to flawlessly wear your all-white outfit and look dapper! When it comes to an all-white look, there haven’t stated that you got to wear the same shade always. So basically, you can mix your shades to have better style. You can go for shades like cream, eggshell or ivory try to play mix and match with your white pieces to get the mode you want. White pieces have a lot of different textures that can help your look way better as long as you pick the one that complements your style and will make you comfy. Leather, cotton, nylon, and linen are the most common textures that are available. A touch of accessories can make your all-white outfit more appealing. Belts and watches add color to your whole appearance and won’t make you look that simple. Wearing an all-white outfit can be a bit tricky since you need to keep it clean. It means you should be stain free. Here are some ways on how to make your white-on-white fashion neat. First thing first. It doesn’t necessarily mean that when you’re wearing an all-white outfit is you won’t eat or drink to avoid stains. You’ll just have to be cautious and watch your every movement while in table. If you happen to have your whites stained. Don’t let the stain dry, wet your clothing with warm water and some stain removing agent. When washing always separate your white clothing pieces from the colored ones. This will make your white clothes safe from dyes. Once your white outfits are more likely losing their color try to buy some special detergent to bring back their original brightness. White-on-white outfits can be worn in many different ways. you just have to follow and find the perfect pieces in your wardrobe to slay your fashion. Carry your outfit with a huge amount of confidence and you’ll look cool af! White-on-white is great for an everyday look. It is a great outfit to choose especially during summer season. The all white fashion will give you a cool vibe. Wear some lightweight shirts and breathable pants for a comfortable yet very stylish look. You can also go with a blazer if you’re going to some party by the beach or by the pool. Shorts and chinos can also be a good option to wear. Top it with some polo or lines shirts and finish it off with a good pair of white sneakers. For warmer weather, a knitted sweater paired with pants or shorts will make you look voguish. When we hear about the formal outfit, the first thing that comes to mind is black and blue suits. But wait up! White suits are also on trend when it comes to a formal party. White suits are the ideal go to when you’re going to some formal summer occasions. First, make sure to have your suit well tailored and has a perfect fit. Consider to have some same shade accessories or go for lighter shades like beige, tan or eggshell. This will give you a smart and sophisticated look and will surely turn heads in the party. 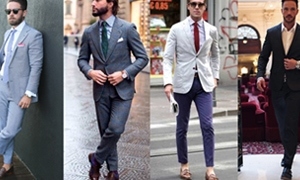 If you want to add some color try to go for soft pastel accessories like belts and pocket squares or even the shoes. Don’t be afraid to go on an all-white formal outfit on your next occasion. All white outfit is not just for casual and formal wear. It is also good for casual sportswear. White has been one of the elements of sportswear back in the days. Wear some crew shirt or sweatshirt and a bomber jacket. Pair this tops with some white shorts or joggers. However, you could always play mix and match with your outfits. A sporty look can also be composed of some white hoodies and T-shirts. Finish it off with white trainers and you’re done.